Bem-vindo ao lago Ky! Se você está olhando para aluguel de férias no lago Ky, então você provavelmente já conhece a beleza da paisagem e da natureza que o rodeia, bem como o lago Ky é o maior lago artificial da nação! Esta casa em particular, como nos referimos amorosamente como nosso lago cottage ponto, não deixa espaço para o erro com as suas visualizações ... eles são de tirar o fôlego, e não vai decepcionar! Este lote é referenciado como o melhor no Kentucky Lake, pois oferece vistas infinitas de ângulos de 270 graus! A casa possui dois quartos; um banheiro; espaço de convivência; Cozinha equipada com máquina de lavar louça, geladeira, microondas, fogão e disposição; Um solário grande possui uma mesa de jantar com capacidade para 10 pessoas e um sofá relaxante para apreciar as vistas; Lavadora e secadora localizadas no armário; Uma varanda coberta com assentos no caso de o tempo tomar uma volta; 2 docas cobertas, uma disponível para abrigar seu próprio barco localizado em uma enseada e a outra doca coberta possui dois elevadores de ônibus, um terraço com muito espaço para estar e localizado no canal principal. Se houver um arrepio no ar, aproveite o poço de fogo sobredimensionado e se recline nos Adirondacks que o cercam ... o lugar perfeito para assar cachorros quentes ou montar s'mores! Um bônus é o caiaque de 2-3 pessoas para você aproveitar ao seu lazer! We found the right mix of a cozy cottage, privacy, and the most incredible view of the lake. A truly magnificent sunrise over the hills of LBL is right in front of you! The cottage is very comfortable for a group of four and has all the necessities. There is a spacious dock where one can spend an afternoon fishing, and the fire pit is perfectly situated on the hill overlooking the lake and dock with incredible star viewing opportunities. Gary was a pleasure to work with and extremely helpful on our first trip to the area. We will surely return. 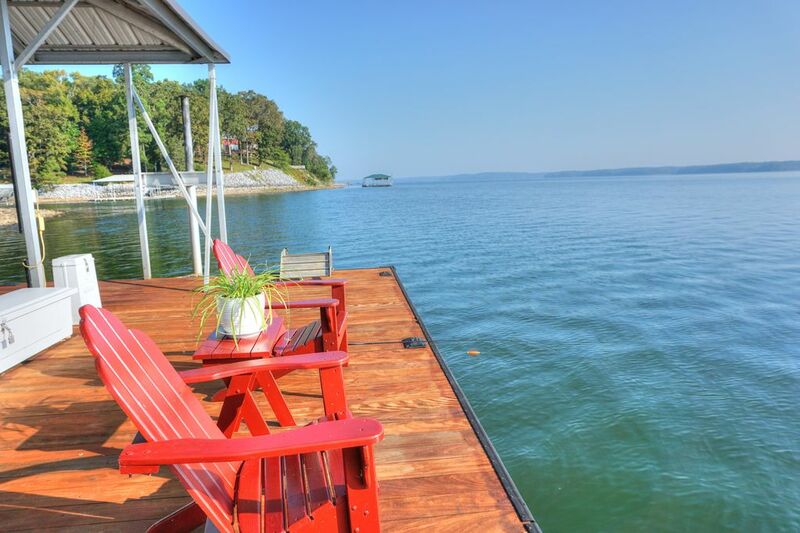 The property has spectacular views, amazing docks for swimming, and plenty of outdoor space. The house is cozy and very welcoming and comfortable. Great hosts! The property is amazing and the pictures don’t disappoint. We checked in on a Thursday and Gary met us there, a really great guy, took the time to show us around give us a lay of the land. We spent the next three days swimming, fishing and hanging out on the dock, and just plain relaxing. If you are looking for a stress free cabin with beautiful views this is definitely the place for you, Gary was great to deal with, and had the answer to any questions we may have had. Look forward to booking this place again in the future!!!! Unbelievable gem on the water!!! This place is just awesome, my husband, our 10 year old daughter and toy Aussie have enjoyed 2 separate 3 day weekends within a month and ready to head back again. Pictures are accurate but do not do this home justice, it is updated, pristine and cozy. The yard and dock are fabulous, the view of the lake is unreal, water from left to right as far as the eye can see. The dock provides calm deep water, good for fishing, swimming, floating and diving. Our daughter had no issue kayaking in the water by the dock and she is not experienced, my husband also used the kayak provided to fish from with great success. There is a Dollar General about 10 mins from the house if any thing has been forgotten. Almost forgot to mention this, I am an early riser and the sunrise here is absolutely amazing, breath taking!!! Gary and Lindy are great host, going above and beyond to make for sure you enjoy yourselves. Love, love, love it!!! Words and pictures really can’t do this place the justice it deserves. This is a must visit location. The views are breathtaking and the cottage is amazing. My family and I had the best time fishing and swimming off the dock. This is a great place to visit for a family vacation. Perfect place to stay on KY Lake. The pictures give an accurate view of the property. The house was nice and clean. The docks were amazing and our favorite part of the property. We spent hours out there fishing and making memories. There is even ladders attached to the dock should you decide to jump in and swim close to the dock. We also enjoyed being able to cook onsite and cool off inside. The view from inside is just as amazing as the view from the dock. We were all sad when it was time to check out. Anyone who loves the lake would enjoy staying at this property.